Emma says people don't use enough tile in kitchens. Backsplashes are the obvious place to have fun with tile, but the motif can be extended along an entire wall. Right on trend, here are 10 creative ways to use tile in your home. I think this trend is great, by the way: I’ve always considered tile as artwork that can add visual interest to any room — and in so many ways. For a long time, the only tile you saw in design magazines was grey or carrara marble. Now the selection is huge and there are so many affordable options. My clients are getting more comfortable asking for tiles with colour, texture, and pattern. If you’re looking for ways to add personality to the busiest rooms in your house, read on. Use bold tiles to really make a statement in a smaller space. In a small bathroom, you can enjoy the tile almost like a picture. It’s also practical — bolder tiles are often more expensive so, if you love them, it’s more affordable to showcase them in a smaller room. Tiles are designed by artists and are visually beautiful. Think of tiles as an opportunity to put artwork on the wall or floor of your shower! Bold tiles can be used to add drama to a small room. Tiles can be colourful or neutral, busy or simple. If they’re slightly concave, tiles create a watery effect as the light bounces off them; if they have a matte finish they can almost seem to absorb light. Think about how a tile might create a certain mood in your kitchen, bathroom, or entranceway. I love to put tiles behind bookshelves or floating shelves as an unexpected way to add art, texture, or colour. Niches and nooks and crannies are also good spots to sneak in some tile — these little spots create a ‘picture frame’ for the tile. 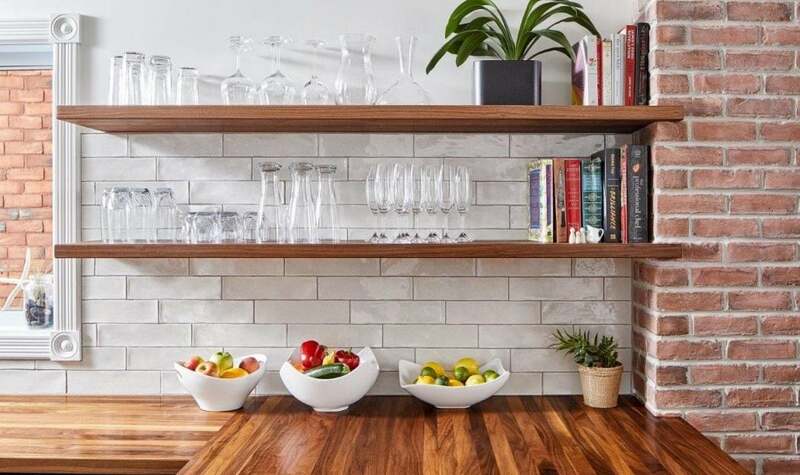 Tile can be used to add visual interest behind floating shelves or, as is the case with this ‘brick tile,’ to hide plumbing or ductwork in a natural way. I don’t think people use enough tile in kitchens. Backsplashes are the obvious place to have fun with tile, but there are often other nooks and crannies that you can add interest to — I love tiling around windows and chimneys. 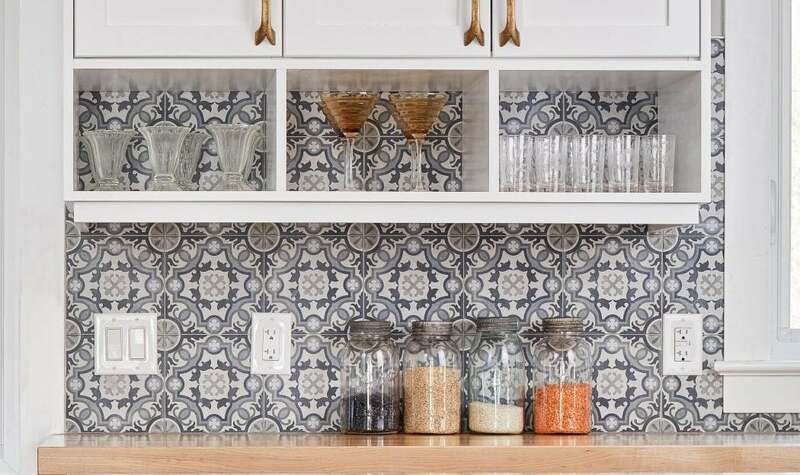 Tiling can also create texture behind open shelving. 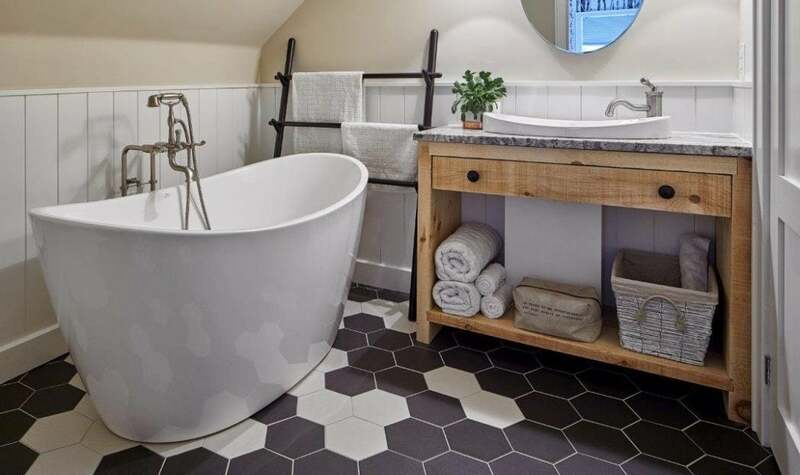 Bold, geometric designs are allowing homeowners to add lots of interest to hallways, laundry rooms, and small bathrooms. Beautiful and washable! A large, geometric design will add visual interest to a small space and is easy to clean. Don’t be afraid to create a pattern using two (or more) colours. Tile is great for hiding plumbing or a bulkhead and can make an awkward space look kind of cool. There are really good tiles out there now that look like brick — they’re a wonderful way to add texture and look authentic to an older home. A strip of beautiful flooring can really make the room. You can also bring that same tile up as a visual element along a wall. Here, black tile is arranged in a strip, adding a decorative border to the bathroom and as complementary element in the shower. There are so many shapes, patterns, and colours out there, but don’t forget the classics. 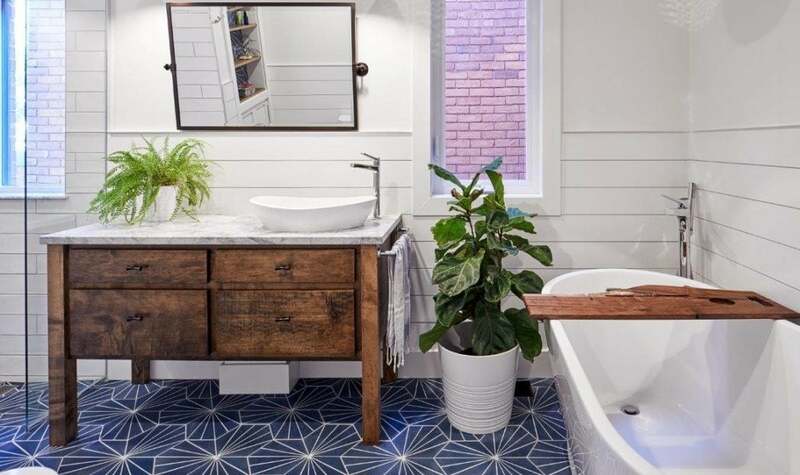 There’s always a place for the iconic subway tile or penny tile. If you have kids, the side of the kitchen island is a great place to have a wall of easy-to-wipe tile where they tend to scuff their feet. 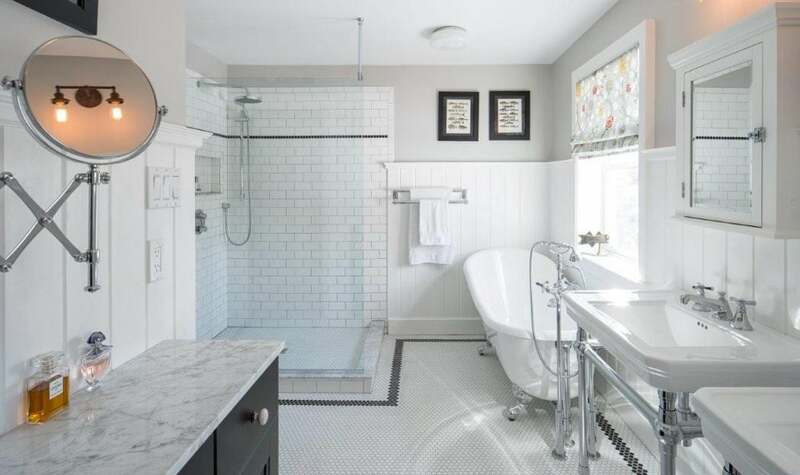 A simple subway tile is perfect here. Grassroots designer Emma Doucet says her passion for design was born in her grandpa’s workshop where she spent many hours wallpapering her dollhouse and changing the finishes. She has transformed a lifelong enthusiasm for good design into a busy 14-member business known for an aesthetic that’s both forward-looking and classical. You can reach her via You can reach her at grassrootsdesign.ca or on Facebook.